If you’re one of the millions of people in the UK who now employ a cleaner, you’re probably all too familiar with quite how awkward it can be sometimes. Yes you pay them to do your household chores for you, but somehow that doesn’t stop us being very British and overly polite when it comes to telling them exactly what we do and don’t want done. In fact, many of us feel so awkward being waited on that we actually resort to making ourselves scarce when the cleaner arrives and end-up just leaving scribbled notes for them to interpret. MoppedUp is a new app that claims it will solve this problem and bring cleaning into the 21stcentury. In reality, what it really does is connect you and your cleaner in a much smarter way. 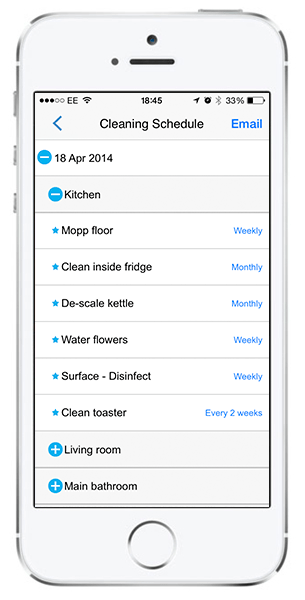 With the app you can change what your cleaner focuses on each week, so next time you’re in the bathroom and notice your shower really needs a good scrub, you can quickly add it to your cleaner’s task list with a couple of taps of an iPhone. It may be simple, but when it comes to communication with your cleaner, MoppedUp has thought of everything, right down to the cleaner being able to add things to a shopping list when they notice you’re running low on essential items. In fact, even if you don’t have a cleaner, MoppedUp can find you the most trusted one in your area, so there really are no more excuses for having a grubby flat. The downside is that it is currently only available for iPhone or iPad, but it doesn’t matter if your cleaner doesn’t have an iPhone – MoppedUp automatically fires them an email of the cleaning schedule so they can access it on any device. It a handy little app for homeowners, and no doubt cleaners will love that it spells the end for illegible scraps of paper, allowing them to focus on giving their customers what they really want.